Who are the gods? What is life without purpose? Fulfillment? What is the dream that can't be dreamed? You are MARIO. You've decided to visit your ailing great uncle in the USSR in the year of our lord 1983, but as you step off the train, you notice a cave... a cave of pure brightness. Your curiosity gets the best of you, so you decide to enter this cave. Admin Note: This game contains some flashy and colorful effects that might be dangerous to those with conditions such as epilepsy. View at your own risk. This game was awesome! Even though there's a glitch with the Para-Troopas where they can sometimes fly of the bottom of the screen and never come back thus leaving you to have to die. Other than that you did a fantastic job! Thanks! Yeah, I was not able to fix that at all. No amount of fail safes between the Para-Troopas would prevent them from randomly doing that, and I think it's just an issue with Clickteam Fusion's collision handling at this point. That's (primarily) why you have infinite lives: it was the best solution I could come up with. Wait...that was accidental? I wrote my review under the impression that it was purposeful, so as to add to the surrealism. That mechanic was surprisingly frustrating. How odd. Guess I need to tone back my benefit of the doubt a bit in future reviews. Apologies if the rest of it was so competent as to make that mistake seem purposeful, but it really was a mistake. I'd never do something that would deliberately screw up the player for the sake of atmosphere - I'm trying to figure out why it happens so I can fix it and (attempt to) upload a new and improved version of the game with some other minor improvements and tweaks as well. I hope so, I did manage to beat the stage out of luck, and the next stage was frustrating..
Oh well, if you manage to fix the Para-Troopa bug, I might get back to it. My man, that's literally nothing to apologize about. 'Twas a fun play. Good game! I will be honest with you this game seems to be an attempt at being as weird as possible and sometimes even a bit creepy kind of weird but the problem with this game is mostly physics related. I have played up until the Wart fight. 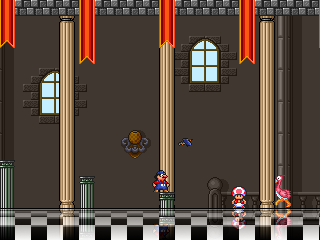 When the game starts you realize Mario cannot run and his jumps are very heavy but the real problem I think comes from the first boss. The Giant Ninji seems to be very random. Sometimes he jumps high, sometimes he jumps low, sometimes he just charges and even sometimes he just gets stuck in the corner. It was at this point I realized something was wrong because after losing to the Ninji rather then starting at the boss you have to slog through the level leading up to the boss then watch the cutscene again before the boss which is long. Same thing happened with Wart that just made me stop playing the game. I suggest either updating the game to either A. start from the boss that you are on or B. give the option to skip cutscenes after viewing them. Also the Ninji should have a pattern because it seems hitting him seems to mess up his pattern and makes the fight harder then it's supposed to be. Oh hey, you're the guy who commented on Charisma 3.1 complaining that the game wasn't the exact thing you wanted and that the only games with substance were platformers. How about that? The giant Ninji is intended to have a random pattern, but it isn't that hard to forecast his movements as while he is erratic at times, he very rarely jumps at such a height that you can't avoid him. Usually he jumps too high and you can walk under him - it's meant to be a matter of dodging him vs. attacking him. I'll give you that, I shouldn't have the player restart the entire prior level and cutscene before a boss because of their own mistakes. That said, without an archaic lives system in place, there would be no punishment for losing the fight. I figure if not that, there would have to be something in place that would encourage the player to not be as careless in boss fights. I can look into allowing cutscene skipping if you die in a boss fight, it shouldn't be that difficult to implement. Of course, due to the nature of the game (with its password system), this would only work on cutscenes right before the boss and only if you die during said boss fight. Finally, the Ninji isn't affected at all by you attacking him - that must be all in your head. I dunno what you're going on about with the Ninji. Of course the movements are randomized; however, his jump trajectories are predictable, and he jumps fairly high, so Mario can move quickly enough to avoid him. I do agree with you on the Wart fight, however. He clearly does get faster as you go, and near the end of the fight, it seems there are some cases where it's literally impossible to dodge his attacks, because he follows closely enough behind his fireballs that you can't jump between him and his fireballs AND jump out of the way without getting hit, but he's not so close that you can jump clear over both him and the fireballs. My years of playing platformers have all lead up to this kind of precise coordination crap. But yeah it is pretty tricky. But I got a hang of it after a while. I'm also sure you can as well. So the Giant Ninji is random. The problem really is because of the physics it can be impossible to dodge him sometimes. When he is low to the screen or doing low jumps it's really hard to dodge him because of his size. Anyway yeah you may have to implement a cutscene skip or just have you start on the boss if you die which would be more recommended I think. It kinda confuses me why this game has a password system instead of saving. Sure, it's a nice Mega Man reference, but I thought saving was a pretty standard thing in fangames, and it just kinda seems lazy to not have it be there. I hope saving gets added in that "new" version you're talking about. The game's fairly short so I didn't intend to have a save system at all, so I just put in the password system mostly for my own amusement (and so you can access the super duper secret level...!) while still managing to be functional. Honestly the password system took a while to program, so to call its inclusion "lazy" (or rather, a lack of a proper saving system) is fairly ignorant of you, no offense. Is the final level the level when you beat the boss which is the green guy? I read that you made the game fairly short. How long is it? I agree with Snessy. Not only is the password not good but the save management in general is bad in terms of checkpoints like I already explained. It's at it's worst during the boss fights. How many bosses are in this game anyway? I only seen two and I beat the first one by sheer luck and got angry because it forced me to watch a cutscene again when I lost to him. When I realized that this was the same deal with the second boss I just rage quit. Yeah, that's the last level. There's also a secret level you can access by entering a certain famous password from Mega Man 2 into the password screen! I'm... not sure how to describe how long the game is. What kind of question is that? Not only is the password not good but the save management in general is bad in terms of checkpoints like I already explained. It's at it's worst during the boss fights. How many bosses are in this game anyway? I only seen two and I beat the first one by sheer luck and got angry because it forced me to watch a cutscene again when I lost to him. When I realized that this was the same deal with the second boss I just rage quit. Okay yeah, awesome. I'm glad you don't like my game and all and I'm busy with stuff so a fix might take a while, so until then might I recommend doing something infinitely more productive like not whining about a free video game you don't have to keep playing if you don't want to? Just a thought. How come in the title it says 2? Is this a squeal? Dang I just got wrecked. WARNING: it was made as an exercise in anger, as the game deliberately does something to confuse and frustrate you. It's extremely short, especially compared to its sequel, but it was something I put together really quickly so it's not that surprising. I also wanted to say that it was really short but really good. Some funny trippy backgrounds. Keep up the amazing work man. Fair enough. Apologies if I came off as ignorant. I do still think a save system would've been a welcome addition to the game. Nah, it's fine! I welcome criticism of my games, I just wanted you to know that this game is anything but lazy and I put a lot of effort and concentration in it, even if the lack of some elements may seem otherwise. Yeah, those trippy screen effects must have taken a long time to make. Looking back I probably shouldn't have used the word lazy in my comment. Edit: Just finished it and realized the game's really short, so it doesn't really need saving. Also I'd like that secret password plz. Yeah, I had kinda guessed that. Anyways, it was pretty cool, but is it supposed to end right after entering the castle? Yeah, that's where the secret level ends. And a checkpoint system for the bosses as well as cutscene skip. Add those and this game would be perfect. First boss jumps offscreen forcing a refresh. No it didn't, you just imagined that. It was all in your mind. Hi, Vitiman just popped in to say that this game was AMAZING! only one minor complaint, in the final wart fight, if you stand in the left corner he cant hit you and it makes the fight really easy. other then that, the game is amazing, i loved the stranger in Moscow + sonic 3 credits theme was amazing, anyway the game was amazing and i just wanted to tel ya that.